Education and Disability: "Equal Right, Equal Opportunity" is the motto of theGlobal Action Week, an annual campaign organized by the Global Campaign for Education (GCE) from 4 to 10 May. Humana People to People supports this campaign. Its aim is to highlight the profound challenges that people with disabilities face in exercising their right to education and lead to a significant change in attitudes regarding the exclusion of children with disabilities, as well as promote an inclusive, quality education for all. Humana People to People supports this campaign as a member of the steering committee of the International Task Force on Teachers for Education for All. In addition to our work on the groung, we are also collaborating with campaign communication and promotion (see video). The Task Force is a voluntary global alliance and an international platform of EFA partners, hosted by UNESCO in Paris. It works to address the ‘teacher gap’ – the acute shortage of qualified teachers which is required in order to achieve Universal Primary Education by 2015, as well as quality education for all. HPP has actively participated in the Task Force since it started in 2009. This year we are a new member of the steering committee, through which we will play an active role over the next two years in a field that needs much progress in order to successfully address the world’s urgent need for better education. Humana has been training teachers since 1993, when we opened our first Teacher Training College in Mozambique. Today, we see 4.800 primary school teachers graduate per year across 49 Teacher Training Schools in Africa and Asia. Through the program, “a rigorous theoretical dimension is combined with strong practical experience, as all students carry out extensive teaching practice in nearby primary schools, actively making connections between theory and practice”, explains Jorgen Ohre, headmaster of the Teacher Training College in Maputo. “Additionally, the curriculum is directly oriented towards the fight against poverty, relevant to the local context, practical and flexible”. The current global scenario faces two main challenges: To ensure that there are enough teachers in classrooms, and to guarantee that they are well-trained. “Far too often teachers remain under-qualified, poorly paid, and with low status”, denounces the 2012 UNESCO Global Monitoring report. According to UNESCO, by 2015 the world will need 1.7 million additional teachers to provide every child with a basic education and 5.1 million teachers to maintain the current teacher labor force and replace the ones leaving. The shortage of well trained, motivated teachers is particularly severe in Sub-Saharan Africa, a region which will need to raise its current stock of teachers by 902,000 posts to be able to reach Universal Primary Education by the end of next year. 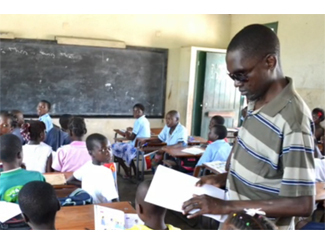 One Teacher Training College in Nhamatanda, in the province of Sofala, Mozambique, currently implements an inclusive education program, providing an opportunity for blind and visually impaired people to become teachers. In this country alone, 1.2 million people, which is about 7% of the population, live with moderate or severe disabilities such as visual impairment. Disability and poverty in Mozambique, as in many other parts of Africa, are closely related. With support from Austrian-based NGO Light for the World, ADPP-Mozambique promotes an inclusive education program for students with vision problems. A total of 40 visually impaired teachers have been trained at this center to date, and now work as primary teachers in several local schools. Logically, writing Braille is essential for both your training and your performance as a teacher. "I'm proud to be a teacher. I can fend for myself and for my family," says Miede Magumba. "I feel fulfilled because I have made my dream to graduate”. 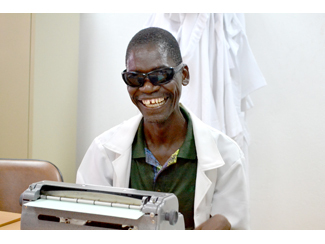 Jului Tecateca, Mozambique’s first ever blind teacher, optimistically adds, "I think that people with disabilities should have more opportunities, creating more training areas so that we can better and further contribute to the development of our communities".